For the first four weeks of the month following Britain’s momentous vote to leave the European Union, half of Britons cannot remember a single business story. Instead, the population's attention has focused on political turmoil, both at home – dominated by the Conservative and Labour leadership challenges – and abroad, including the failed coup in Turkey and the political party conventions in the US. Also prominent in people’s minds are the terrorist attacks in Nice, Istanbul, Munich, Wurzburg, Reutlingen and Ansbach. Indeed, EDF’s commitment to build two nuclear power stations is the only business news to be noticed by more than a quarter of the public this month. Though recall of businesses in the news is lower than in any month this year, a few stories punch into public consciousness. Though the impact of Brexit on British businesses has been relatively muted to date, many of the most frequently recalled companies in the news have a Brexit angle. In the first week of July HSBC and Barclays announced that they would move jobs to Europe if Britain leaves the Single Market. In addition, Britain’s vote to leave the EU has been blamed for the falling share prices of many banks and airlines – such as Virgin and easyJet – though most had stabilised from precipitous falls at the end of June. Low Cost Travel Group, which went into administration in the third week of July as people delayed booking their holidays, has been touted as the first major business casualty of Britain’s vote to leave the EU. 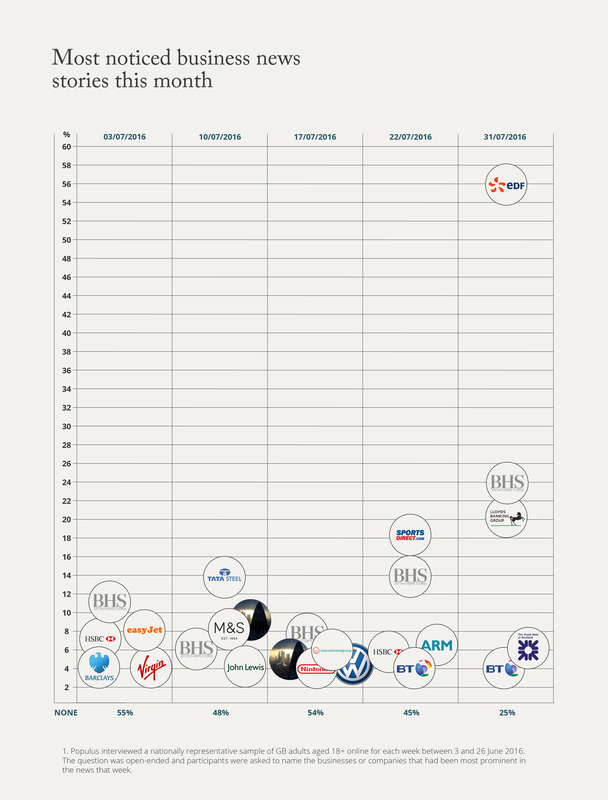 In addition, some analysts suggest that the £32bn takeover of highly successful British company, ARM, by Japan’s Soft Bank, could be the first in a wave of takeovers of UK companies by foreigners made possible by the falling value of the pound. While Brexit may have a significant impact on businesses in the medium term, companies should take care not to use Britain’s departure from the EU as an excuse for poor business performance. In the second week of July M&S blamed its 9% slump in quarterly clothing sales (at least in part) on uncertainty due to the EU referendum. Few find this kind of explanation convincing or reputation-enhancing. Rather than using Brexit as an excuse for poor performance, companies should focus on describing how poor performance will be improved in the future. It’s just too early to blame Brexit for poor business performance. However, it is important for companies to describe clearly the challenges that they face as a result of Brexit and what they expect from Britain’s negotiations to leave the EU. In the same week that M&S blamed the referendum for its poor sales, John Lewis warned that a weakening pound would hit the cost of imports and dent consumer demand over the medium term. It also called for the government to clarify international trade relationships and the status of European workers in the UK. Though this was noticed by a minority of the public, it is vital that businesses develop a strong narrative and set of demands as the government enters into negotiations to leave the EU. 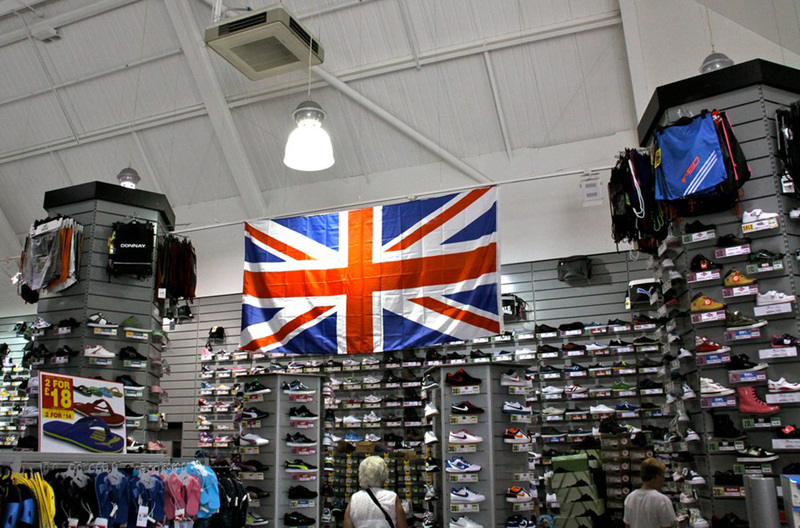 In the fourth week of July, a fifth of Britons noticed Sports Direct in the news. A scathing parliamentary inquiry found that billionaire, Mike Ashley, grew Sports Direct into a retail giant with a business model that treats workers ‘without dignity or respect’ and ‘as commodities rather than as human beings’. The BIS select committee chairman, Iain Wright, described the working practice at the company’s Shirebrook distribution centre as ‘closer to that of a Victorian workhouse than that of a modern, reputable high street retailer.’ The committee was particularly critical of Sports Direct’s retention of more than 3000 warehouse workers on short-term, temporary contracts to reduce costs and evade its responsibility as an employer. So far, Ashley and Sports Direct have said little in response to the findings. To recover from this reputational mauling, Ashley needs to make good on his commitment to address any shortcomings in the working practices at Sports Direct. The first step should be a genuine apology from Ashley on behalf of Sports Direct management to warehouse and shop workers. Next, the business should demonstrate its commitment to treating its people with dignity and respect by ending, so called, ‘zero-hours contracts’ and placing staff on regular contracts with full employment rights. This will incur significant cost and may hit profits, but the risk of doing nothing and watching customers, sickened by the revelations, walk away from Sports Direct could be much greater. One of Sports Direct’s biggest suppliers, Nike, is a case in point. In 1997, public anger over the sportsware firm’s use of ‘sweatshops’ in developing countries to produce low cost products, came to a head with the company’s share price falling by 51% as people moved away from the brand. The Nike turnaround started with an admission from its then-CEO, Phil Knight, that the Nike logo had become ‘synonymous with slave wages, forced overtime, and arbitrary abuse’ and that ‘the American consumer doesn’t want to buy products made under abusive conditions’. He ended the speech announcing that Nike would raise the minimum age of workers, significantly increase factory monitoring and commit to clean air standards. In later years, Nike founded the Fair Labour Association, performed 600 factory audits to prevent the worst abuses and became the first in the industry to publish a complete list of its factory contracts. Eventually, public opinion turned and the company’s share price recovered. It is now more than ten times that of the late-1990’s. Ashley should heed the lessons of a business that has been badly damaged by abusive working practices, but has come back stronger. The most noticed business story in July hit the headlines at the very end of the month. 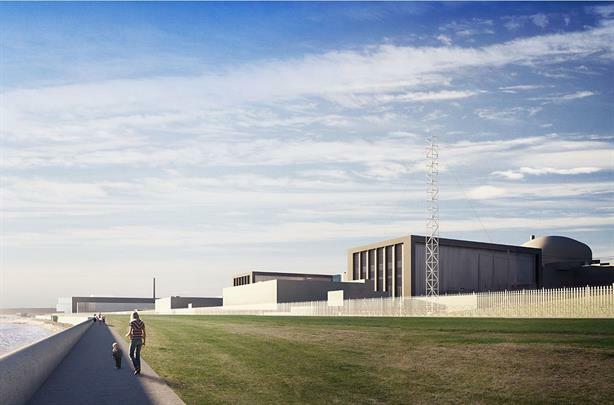 After months of delay and angst over the affordability of the project, EDF finally committed to build two nuclear reactors at Hinkley Point only to be told by the British government that the decision to go ahead would be paused while its merits were considered. While the £18bn deal, which would deliver 7% of the UK’s current power requirements, may still go ahead, speculation is rife that the British government has cold feet. Some say that the high guaranteed price of electricity which consumers would have to fund for at least thirty years has scuppered the deal. Others suggest that the project has been crippled by fears in Number 10 that China’s involvement in such a large infrastructure project compromises national security. The stakes could not be higher. Demand for electricity is due to outstrip supply in the UK within a decade and the government has no clear plan B if the Hinkley Point deal is scrapped. In addition, EDF is 80% owned by the French government, a key player in the Brexit negotiations. 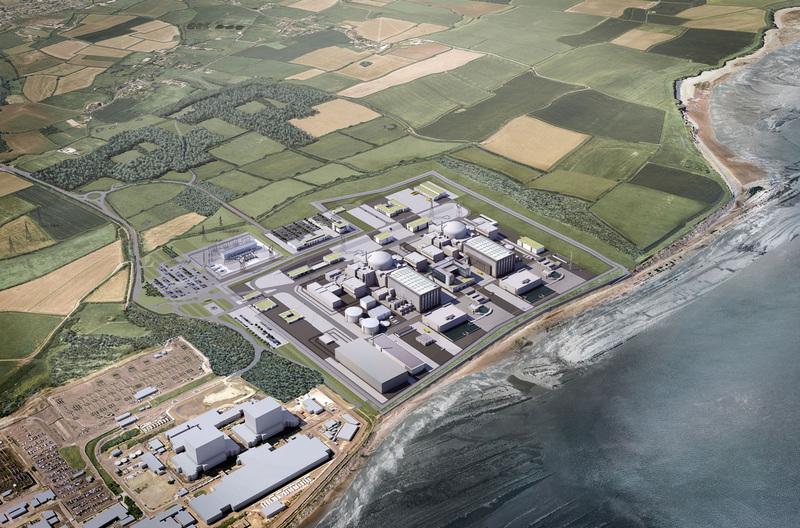 China has upped the ante further by threatening to pull £100bn of investment in Britain over the next decade if the Hinkley Point deal is cancelled. The decision whether or not to go ahead with this economically and politically sensitive mega-deal is likely to be the first major decision of Teresa May’s new cabinet and could set the tone of the Brexit negotiations and Britain’s relationship with the rest of the world, particularly China. If the deal doesn’t go ahead, the government must present a credible alternative to meeting Britain’s emerging energy gap and demonstrate to the world that the country is ‘open for business’. Without evidence to support these assurances the government’s reputation could be torpedoed before it leaves the port.